Amanda is a world traveller, dancer, yogini, and intuitive whose passion for adventure has lead her to explore over 20 countries. She fell in love with yoga at the age of 6 and has been teaching flow, yin, and cardio style yoga for the last 6 years. Whether you are a beginner seeking a relaxed candlelit evening class or a more advanced student looking to get a sweat going at cardio yoga, Amanda's class has a place for you. Her passion for belly dance manifested while living in Dubai for 3 months in 2011. 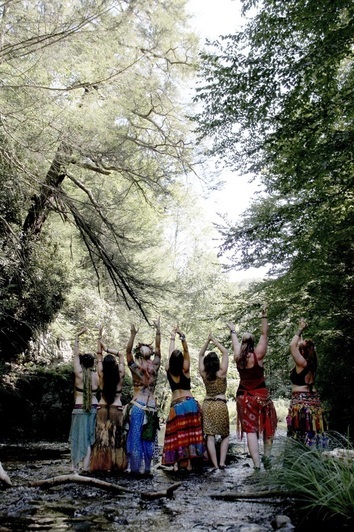 She now teaches tribal style belly dance, performs, and choreographs with her dedicated students. Amanda believes that dance is a place of sisterhood, where we celebrate one another as we play and simultaneously heal our bodies. She has secondary studies in various forms of dance from her travels to countries such as Bali, India, Macau, and Tahiti. She is also a reader of runes, oracle cards, and is an intuitive healer and shamanic practitioner. We'd love to share with you! "I journey, I breathe, I walk barefoot on the earth. I am here to share... movement, breath, freedom, adventure, knowing. Call it yoga, call it dance, call it tapping into divine expression. Let us explore, together. <3"
Though a native to Phoenix, Arizona Amanda has traveled to over 20 countries studying and teaching as she goes. Amanda graduated from Yoga Pura's 500 hour yoga teacher training of 2009-2010 and has been teaching ever since. She is the former owner of 'Baretoes Yoga and Belly Dance,'' a yoga and dance studio based in eastern Pennsylvania. Amanda is both teacher and performer and lead and choreographed for the troupe 'Baretoes Belly Dancers'. Her dance studies include Belly Dance, Kalbeliya Gypsy Dance, Hula & Tahitian Dance, and Aerial Arts. She is also an arco yogi and fire performer. Amanda has taught and performed at numerous events over the years including festivals, night clubs, receptions, private house parties, and corporate events.